In 1941 a group of parishioners from San Francisco’s Corpus Christi Church set off for Genoa Italy with the intention of acquiring a statue of the Madonna della Gaurdia. This 5-foot-tall statue is what they returned with. 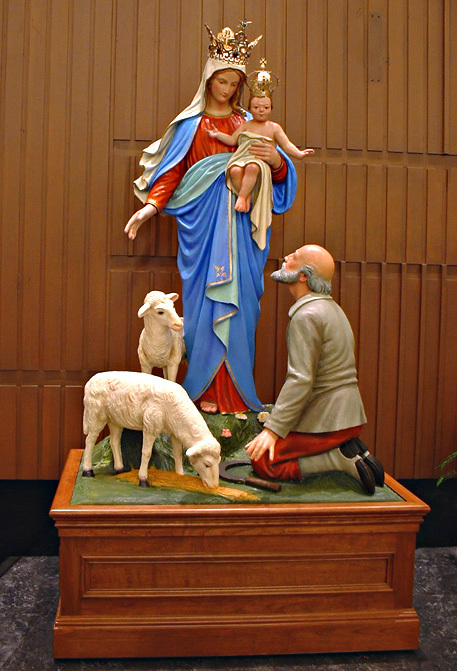 An arsonist broke into the church in August of 2006 and set the blanket-wrapped statue on fire. The firefighters who responded started beating out the flames (not knowing what was under the flaming blankets) and in so doing knocked heads, hands and arms off of the statue. After much deliberation about replacing the statue versus restoring it, a small group from the church approached San Francisco sculptor Phil Diers who recreated all of the missing pieces. Phil put them in touch with me, and I was able to work from old photographs to paint the statue to look the way it had before the fire. I think the photos tell the story.